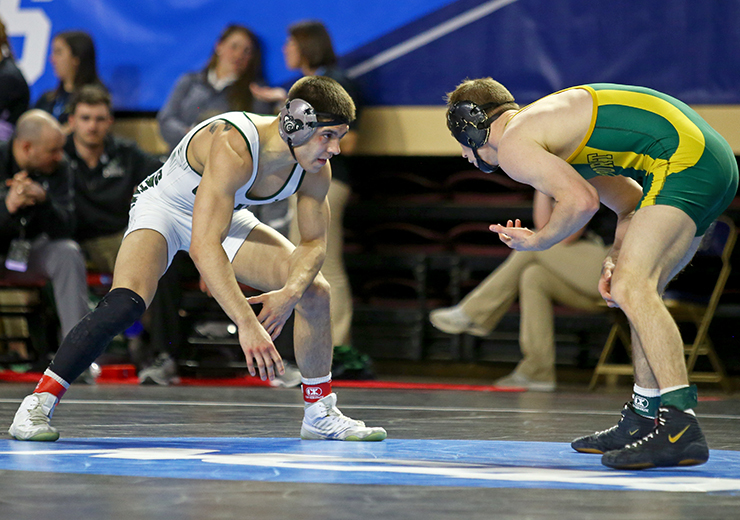 The end of the 2018-2019 wrestling season for Castleton occurred on March 8 and 9, as senior Jesse Webb and junior Max Tempel made the journey to Roanoke, Virginia to participate in the NCAA Division III National Championship Tournament. Webb and Tempel qualified for nationals by finishing second and third in their weight classes at the Regional Championship Tournament, at Johnson and Wales University in Providence, Rhode Island. This a huge stepping stone for the program, as it is only in its third season. “For me, I was just thinking about how this was my last trip ever,” said Webb, a Physical Education major from Bennington, Vermont. Webb has an interesting background, having prior experience with head coach Scott Legacy. Legacy, who has been the head coach from the get-go at Castleton University, was the head coach at Mount Anthony High School in Bennington, Vermont. Both Tempel and Webb were selected as captains for this season, a true testament of their hard work and dedication to the young program. “Just knowing that the coaching staff has that trust in you and having that responsibility of leading by example, doing the right things, just being some guidance for the younger guys coming in, I am definitely honored to serve as a captain to the program,” said Tempel. Although Tempel and Webb fell short in their goals to be named All-Americans at the National Tournament, the two understand that the journey is more important than the accolades that they achieve.